Scott Summit created a 3D model of his ideal guitar and sent the computer design to 3D Systems, which used its massive 3D printers to transform the graphic model into an actual acoustic instrument that Summit can play, Bloomberg Businessweek reports. 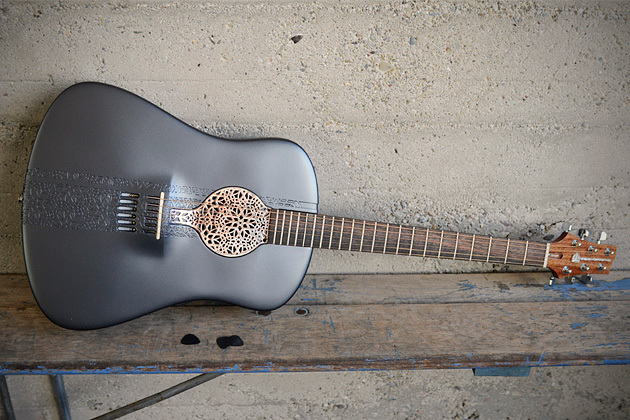 As far as anyone seems to know, this is the first 3D-printed guitar on the planet, and it raises all kinds musical possibilities. “It’s rich and full and has a great tonal range,” says Summit. The model used about $3,000 worth of plastic and had a headstock 3D printed with sterling silver; the plate on the neck was 3D printed out of stainless steel. Summit is one of the world’s leading 3D printing and design experts. He is currently designing custom body parts and stylish prosthetics that get built from 3D printers. UPDATE 10/18/2012: 3D Systems announced today the exclusive availability of the first-ever line of 3D printed electric and bass guitars, designed by Olaf Diegel on Cubify. Starting today, eight unique electric and bass guitar designs including the Scarab, Atom and Spider will be available for purchase on Cubify. Professional guitarists and enthusiasts alike will be able to work directly with Diegel to customize their instrument for a personalized look and unique sound.